It's a sad reality but, identity fraud is on the rise these days, and it is now more important than ever to make sure you dispose of any sensitive data in the correct way to avoid somebody stealing your details. Bank statements, personal letters and anything containing details such as your date of birth or National Insurance number, should always be destroyed. But, if you are not investing in an industrial-sized, corporate office paper-destroyer, what are your options? What is the best shredder for a home office? The type of shredder you choose will depend on what documents you need to shred and in what quantity. Most standard shredders can cope with basic paper but there are a few features to look out for if you’re going to be shredding on a large scale. Some shredders claim to be able to handle around 20 sheets of paper at a time but if you want to be shredding that amount, be sure to also choose a machine with an anti-jam mechanism to avoid having a fight with your shredder. Lots of papers also means lots of cuttings, so a large capacity shredder will mean you don’t have to empty it as frequently and pull-out bins tend to be much easier to empty rather than battling with trying to life the entire device and then spilling the shreds all over the floor. Most machines these days offer cross-cut shredding which will chop your documents up into confetti-like pieces so there is no chance anyone could piece them back together, unlike the more uncommon strip shredders. So whether you have a tonne of paperwork you need to sift through, or you’re looking to keep on top of any junk mail you receive’ we’ve rounded up the top 5 shredders to suit all lifestyles and budgets. So don’t risk your documents being stolen; invest in a shredder today. 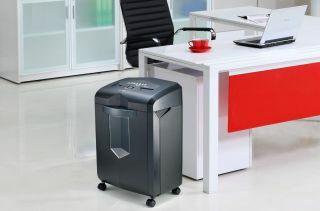 This powerful shredder is great for a home office that has a high quantity of documents to dispose of on a daily basis. Not only does it shred paper but it can also cut through staples, credit cards and CDs. It can take up to 14 sheets of paper at a time and the pull-out bin makes it incredibly easy to dispose of the shreds when you’re finished. Customers noted the machine can get a little hot and overheat if used for too long, but for frequent everyday shredding in standard quantities this machine holds up well and gets the job done quickly and efficiently. Users also say it is surprisingly quiet which is a desirable factor when shredding so often. If you’re short on space then this smaller, more compact shredder would fit nicely in any home office. It can take up to 7 sheets at a time and works fine on credit cards and other strong materials such as staples. Users find it easy to feed the paper into the machine and easy to empty with its pull-out bin but it has the potential to jam if not emptied when full. It does tend to get full quickly if you’re shredding on a daily basis but for those only shredding occasionally, this is a handy little machine. This shredder means business. Not only is it huge, but it is super smart and quiet at the same time. It features specialist technology that can detect when hands are too close to avoid any horrible accidents and it aims to be much quieter than other standard shredders to help minimise disruption to the rest of the house or office. Users find it smooth to feed and have no problem feeding it continuously without any jamming. A little pricier than others but if you produce a lot of paperwork this shredder will definitely save you time in the long run. If you’ve got masses and masses of documents that need to be destroyed, then this shredder will serve you well. It features overheating and overloading protection; something many other shredders don’t have. This allows you to shred continuously for up to 30 minutes without the machine going into overdrive. Some users with extra sensitive documents say this machine doesn’t cut as finely as they’d like, but for general letters and documents it is efficient and effective in shredding it into confetti-like pieces that can then be safely disposed of. This AmazonBasics shredder is excellent value for money and is ideal for anyone who wants extra peace of mind that their information has been totally destroyed. It has micro-cut blades which cut paper into tiny pieces which are 6 times smaller than the average strip shredder, and it also has a special credit card slot to dispose of bank cards. It doesn’t have a very long run time, and requires 30 minutes of cool down before you shred again, but for anyone who only shreds occasionally, this is an excellent value for money machine that will hold up well for years to come. Looking to shed some light on your home office desk? Check out our guide to the best desk lamps.